Welcome to another blog hop, where writers from around the world come together to create a circle of posts all on the same topic, yet each from our own perspective. For this round of the Tarot Blog Hop, our wrangler, Joanne Sprott of Cosmic Whispers Tarot, challenged us to write about the Sun and/or Mercury's presence in the cards. 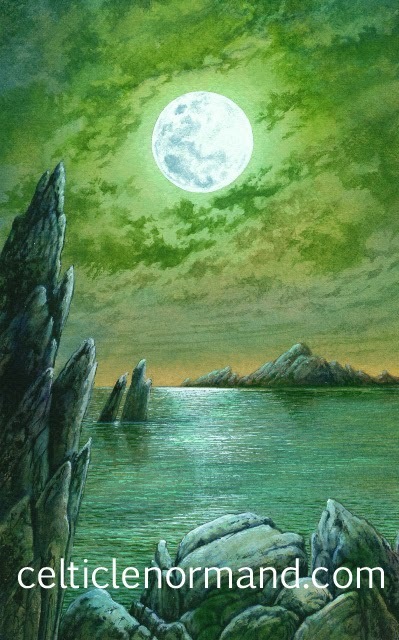 The meanings of the Moon vary from mystery and confusion (tarot), to fame and emotions (Lenormand), as Ethony explored last blog hop. Likewise, the Tower in the Tarot is a card that strikes terror into many, with its threat of sudden, shattering events that upset our fixed ideas and sense of self. Meanwhile, in the Lenormand system, it indicates authority and institutions, the top echelons of power, and the aloofness and loneliness these can all entail. While there is no Rider in the Tarot, some people have tried to compare this card to the Tarot Knights. However, it is more often Pages that are connected with messages. And while the Rider is energetic and denotes movement, he doesn't have any of the subtleties of the Knights, such as variations between where his attention is focused, or how reliable he is. 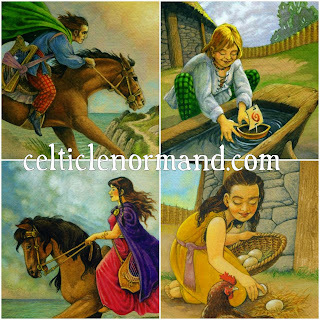 And the Tarot Pages, while sometimes connected to the idea of children or a child-like energy, are also mostly unrelated to the Lenormand Child. The Child has no connection to messages, nor to learning. It is far more about innocence, openness, naivety, honesty (not something you'd connect with the Page of Swords, for instance), and new beginnings. Although some of these characteristics might be attributed to the Pages, once again there is the lack of focus on where these are applied, so important to understanding the Tarot Pages. 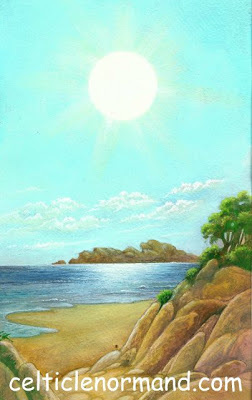 Coming back to the Sun, in both systems this is a card of joy, success, energy, and enlightenment. You might say that this is because the Sun is so simple and clear in its effect on our lives, so how could it be seen differently. However, looking around the world, that isn't so. For example, in countries where droughts are an issue, the sun is not seen just as a happy harbinger of good harvests. Instead, it is a fierce challenger, sucking the life out of both land and people. Even the energetic, dynamic aspect of the Sun is not as clear cut as you might think. While in the English language, there is a tendency to see these characteristics as male, and while that is echoed in the Roman languages - le soleil (French), il sole (Italian), el sol (Spanish) - in German the sun is female (die Sonne). In Japan, the Sun is associated with the Goddess Amaterasu, linked to beauty, royalty and creativity. Thoroughly enjoyed reading about the mercurical variations - thank you! A nice look at the Lenormand vs the Tarot, Chloe. Thanks! Not too familiar with the Lenormand, so the comparisons were very useful to me. Many thanks! I enjoyed reading this and.....I need to get my Lennies out!!!! Fascinating exploration of the sun card and such beautiful cards too. Thanks so much for sharing! What a fun read! It is interesting the gender we assign to celestial bodies. In Norse myth, the sun is female and the moon is male... ! I always found the different ways of gendering the sun fascinating too! I think it is more often feminine in cold icy climates where the sun's heat is soft and nurturing. It's masculine where it is as you say challenging. And I love the story of Amaterasu as well! Thanks for an interesting post!